Comments: Of the three jaegers, Longtailed Jaegers are the most petite and have a graceful, ternlike flight. Breeding adults have long, ribbon-like central tail streamers. They have distinctive clean cap. Their breasts are generally light colored and do not have breast markings as other jaegers. They breed in dry, upland tundra and feed on rodents, berries, insects and young birds. They winter in the southern temperate oceans. 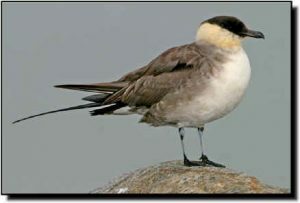 Long-tailed Jaegers occur in small numbers or are found only in localized sites within the Great Plains.